First East Lothian had the Edubuzz.org blog publishing system. Then along came Glow, Scotland’s schools network. And now – as if that wasn’t enough -we’ve now added an Edubuzz “Google Applications for Education” system. How do this lot fit together? Will they all continue? If you’re struggling to make sense of it all, read on: this note is for you. Before looking at the tools, let’s look at the way the world is changing. ICT in schools used to centre on the computers, and the programs we installed. That’s all changed; access to network resources like search engines, web sites and communication and collaboration tools is now more important. The web is no longer just a place we go to read things; we also now expect to contribute. Enabling schools to prepare students for this world was the reason for Glow. By providing a national system, free to councils, it aimed for learner equity. Glow provides a toolset for learning, communication and collaboration. But it had to be acceptable to all, so is conservative in its design. It doesn’t yet, for example, include easy web publishing. Popular features include web conferencing, free access to high-quality subscription sites and national staff networking via Glow Groups. Almost all schools have now had introductory training, and we’ll support you if you want to explore Glow and use it with your classes. Accounts are available for all staff and students, and it’s being used in most schools. Our Edubuzz blog system started with an attempt to improve sharing between schools and learners in East Lothian, and has grown to become a leading education web publishing system. It’s easy to use, yet powerful, and has been adopted by almost all schools. Where Glow is currently almost completely private, Edubuzz blogs are on the public Internet. That world audience can be important in engaging students with authentic tasks. They’re also interactive so allow schools to open up new dialogues with parents, students and others worldwide. Glow is being refreshed to include blogs, and these are expected to become available during 2010. Meantime, Edubuzz blogs fill the gap. Glow’s email system wasn’t ready in time for cessation of the earlier commercial service, and didn’t meet some secondary needs. The contingency plan, an Edubuzz “Google Applications for Education” Mail system, successfully met school email needs at no cost. It soon became clear that its other components, Sites, Calendar and Documents, enabled introduction of new, highly engaging, forms of collaborative learning activities. Sites: create attractive private or public web sites in minutes, and easily embed documents, interactive forms, videos etc. Experience has shown these tools to be very popular, not least because ease of use is excellent. Staff and student logins are available on request. Keep up to date with latest from the East Lothian Education ICT Team on their own blog. Lots of East Lothian pupils and teachers now have access to an EduBuzz Google Apps account. This brings the power of Google’s email, docs, sites and calendars into the classroom. Robert Virtue from the CDT Department at Musselburgh Grammar School has kindly shared how they are making use of these tools with their pupils. We are in the process of introducing online assessment and evaluation using google docs. 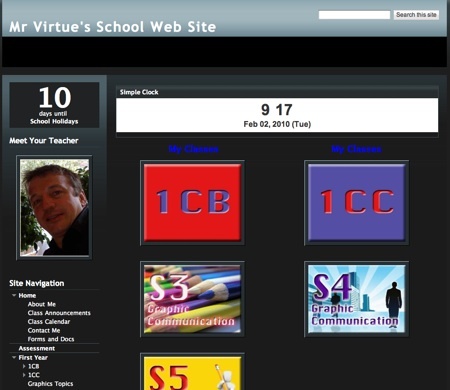 Staff invite their classes to view their own web pages where course work, examples of work, tests and evaluations are kept. All pupils work is saved in jpeg format and uploaded to their personal web pages. Staff can access these sites to moderate pupils performance. In what ways does this practice relate to Curriculum for Excellence? Evidence of literacy can be gathered for all work through the online evaluation. Pupil engagement and high interest, along with good use of ICT through use of internet searching, digital cameras, blogging software, as well as being introduced to a range of computer packages which include Photoshop – Inventor – Google Docs and Comic life. Collaborative work and working with others is evident in all stages of this initiative. To educate pupils in a way that will enable them to make informed decisions regarding applying a range of skills, processes to their work in order to have maximum success and fulfilment. To try to encourage pupils to produce high quality work, work with others, use ICT with confidence and write extended answers whilst evaluating their project work. It still in its early stages but I would increase the length of the class tests to fully examine pupil performance. A huge thank you to Robert, and the MGS CDT Department, for sharing this. If you don’t yet have an EduBuzz Google Apps account, but would like one – email David Gilmour.